Posted by graveyardrabbitsdc in cemetery, headstones, Lewisville. 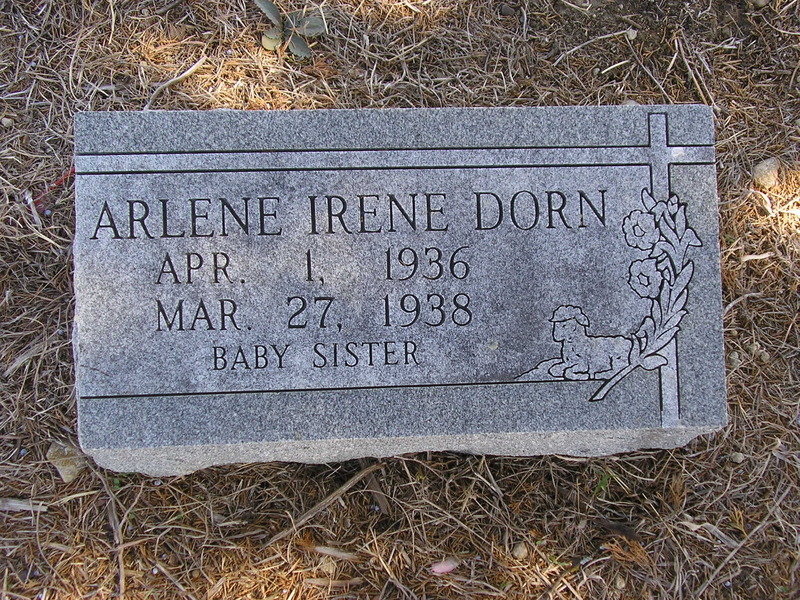 This gravestone at Round Grove Cemetery is for Arlene Irene Dorn who died just shy of two years old. The lamb lying down on the stone symbolizes purity and innocence as well as denotes that this the deceased was a Christian. 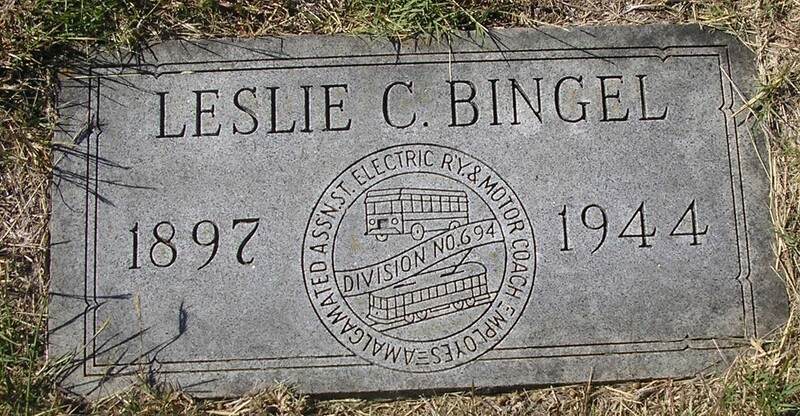 Leslie C. Bingel was a member of the Amalgamated Associaton of Street, Electric Railway and Motor Coach Employees of America, Division No. 694. According to Google Books this union was formed in 1892 in Indianapolis. In July 1964 it became the Amalgamated Transit Union. The graphic on the stone symbolizes this union. 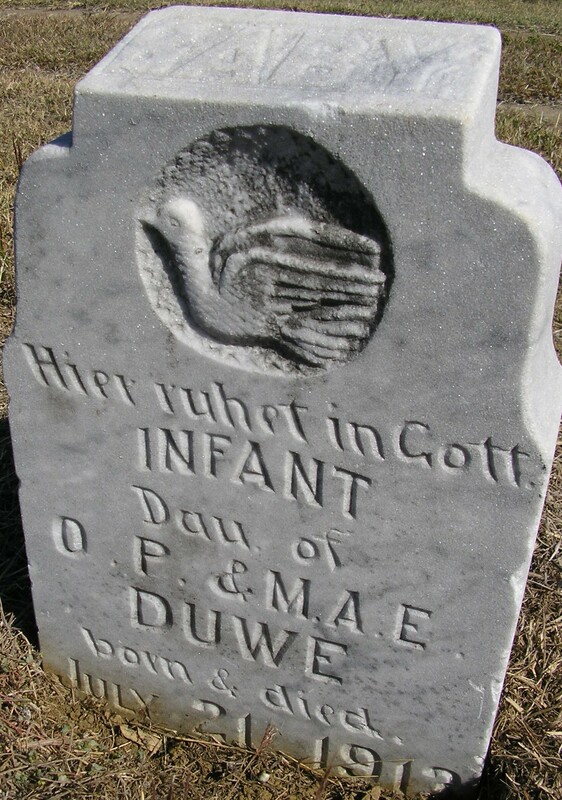 The Dove carved into this head stone for the Infant Daughter of Otto P. and Martha Duwe symbolizes purity and innocence of a child who died very young. 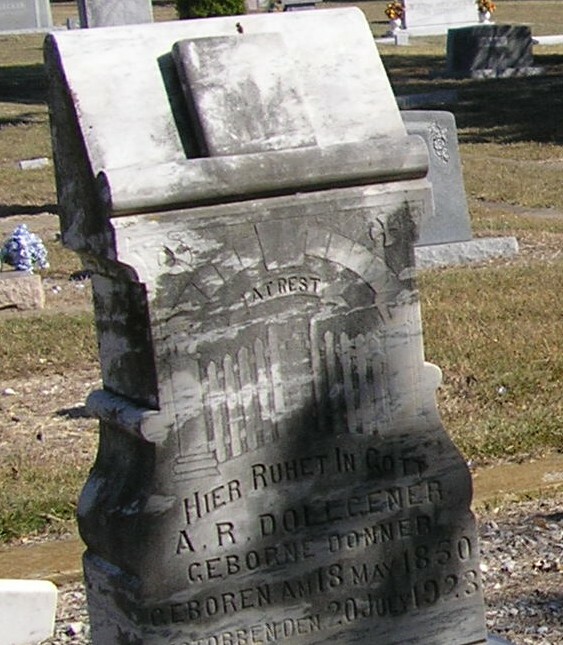 This infant was probably stillborn as no name is given on her stone. 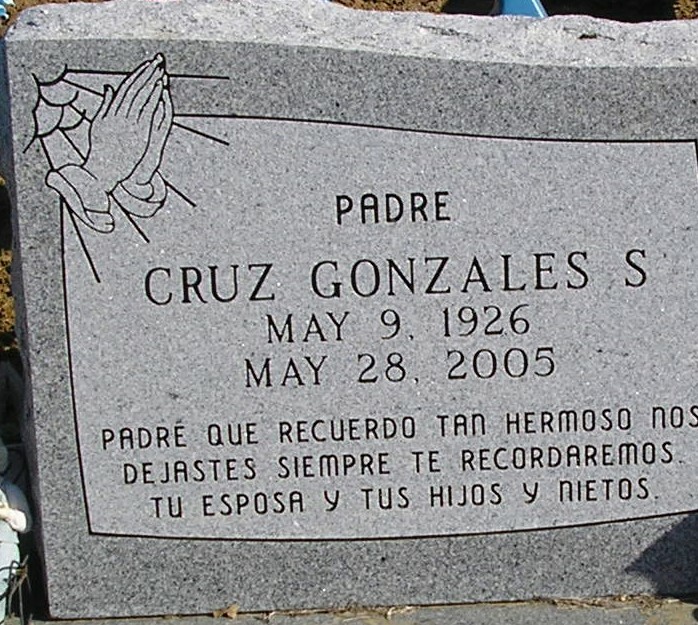 Cruz Gonzales’ stone shows the Praying Hands in Sunlight. The sunlight seems Heaven sent bathing the clasped hands. This stone has two distinct symbols – the Book which represents the Bible or the Book of Life – and the Gates of Heaven. This woman’s husband’s stone has the same symbols. Posted by graveyardrabbitsdc in cemetery, Lewisville. 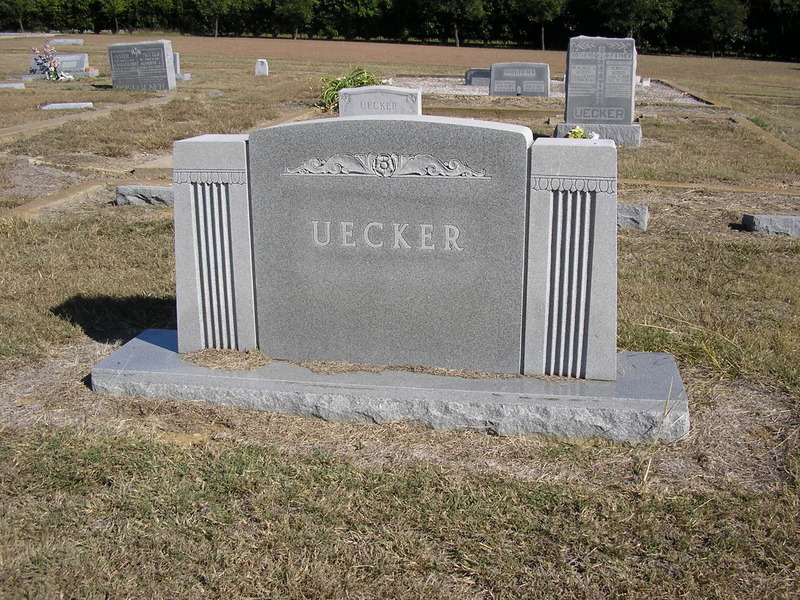 Several family members are buried in this plot including the oldest members of the Uecker family – Henry and Wilhelmine (see this post). Digital photo owned by Wendy Littrell (address for private use). When I rise up, I will be with Jesus for eternity. 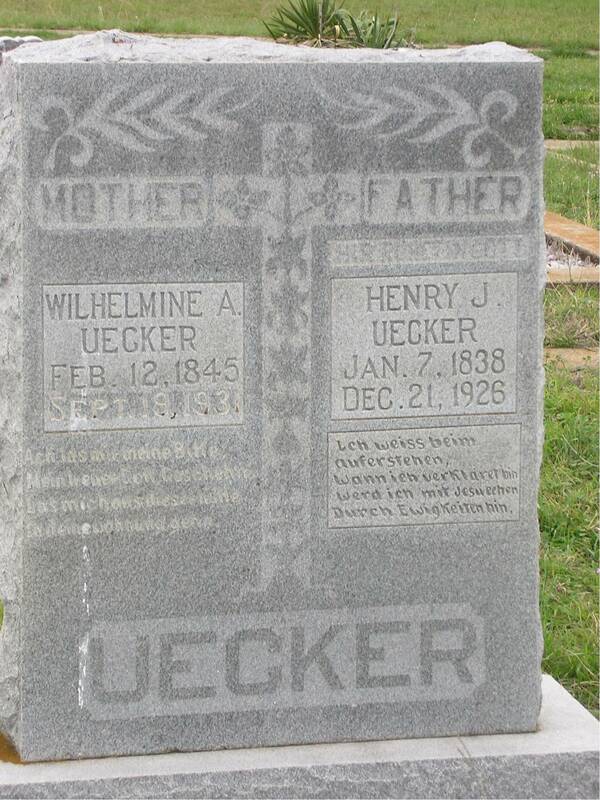 German words were inscribed on these stones since Henry Uecker and Wilhelmine’s family immigrated from Germany. The language spoken in the church and the community for several years (until World War I) was German. The inscription ties the Uecker’s to their culture and home country. German immigrants to the southern Denton county community of Lewisville formed a church in 1901. 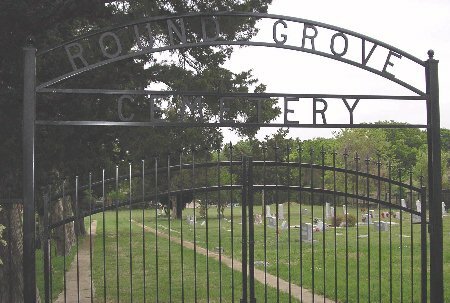 They also founded the cemetery adjacent to the church along FM 3040 which is also known as Round Grove Road. The land was given by one of the founding members of the church. Today the church name is Round Grove United Church U.C.C. and the cemetery is Round Grove Cemetery. For over 107 years this cemetery has been active and plots are still available for purchase. The following maps show the approximate location of Round Grove Cemetery. It is located between I-35E and Business 121 in Lewisville, Texas. The physical (not a mailing address) is 248 E. FM 3040, Lewisville, Texas 75067. For inquiries about this cemetery please contact the church office at Round Grove United Church U.C.C..
Disclaimer: I am a member of Round Grove United Church U.C.C., a member of the Cemetery Board for Round Grove Cemetery, webmaster for the church, and the administrative assistant. I chose this as my first post concerning cemeteries of southern Denton County since I am very familiar with this particular location. Cemetery picture: Photographed by Wendy Littrell, April 6, 2006.